The United States Football League (USFL) was an American football league that played for three seasons, 1983 through 1985. The league played a spring/summer schedule in each of its active seasons. The 1986 season was scheduled to be played in the autumn/winter, directly competing against the long-established National Football League (NFL). However, the USFL ceased operations before that season was scheduled to begin. The ideas behind the USFL were conceived in 1965 by New Orleans businessman David Dixon, who saw a market for a professional football league that would play in the summer, when the National Football League and college football were in their off-season. Dixon had been a key player in the construction of the Louisiana Superdome and the expansion of the NFL into New Orleans in 1967. He developed "The Dixon Plan"—a blueprint for the USFL based upon securing NFL-caliber stadiums in top TV markets, securing a national TV broadcast contract, and controlling spending—and found investors willing to buy in. Though the original franchise owners and founders of the USFL had promised to abide by the general guidelines set out by Dixon's plan, problems arose before the teams took the field, with some franchises facing financial problems and instability from the beginning. Due to pressure from the NFL, some franchises had difficulty securing leases in stadiums that were also used by NFL teams, forcing them to scramble to find alternate venues in their chosen city or hurriedly move to a new market. The USFL had no hard salary cap, and some teams quickly escalated player payrolls to unsustainable levels despite pledges to keep costs under control. While a handful of USFL franchises abided by the Dixon Plan and were relatively stable, others suffered repeated financial crises, and there were many franchise relocations, mergers, and ownership changes during the league's short existence. These problems were worsened as some owners began engaging in bidding wars for star players against NFL teams and each other, forcing other owners to do the same or face a competitive disadvantage. On the field, the USFL was regarded as a relatively good product. Many coaches and team executives had NFL experience, and many future top NFL players and coaches got their start in the new league, including several who were later inducted into the Pro Football Hall of Fame or the College Football Hall of Fame. The Michigan Panthers won the first USFL championship in 1983. The Philadelphia Stars won the second USFL championship in 1984, and after relocating to Baltimore, won the final USFL championship in 1985 as the Baltimore Stars in what was effectively a rematch of the first USFL title game. In 1985, the USFL voted to move from a spring to a fall schedule in 1986 to compete directly with the NFL. This was done at the urging of New Jersey Generals majority owner Donald Trump and a handful of other owners as a way to force a merger between the leagues. As part of this strategy, the USFL filed an anti-trust lawsuit against the National Football League in 1986, and a jury ruled that the NFL had violated anti-monopoly laws. However, in a victory in name only, the USFL was awarded a judgment of just $1, which under anti-trust laws, was tripled to $3. This court decision effectively ended the USFL's existence. The league never played the 1986 season, and by the time it folded, it had lost over US$163 million. The USFL is historically significant in part for the level of talent that played in the league. The league was noteworthy for signing three consecutive Heisman Trophy winners: Georgia running back Herschel Walker and Boston College quarterback Doug Flutie signed with the New Jersey Generals, and Nebraska running back Mike Rozier signed with the Pittsburgh Maulers out of college as did numerous other collegiate stars. Future Pro Football Hall of Fame members defensive end Reggie White of the University of Tennessee, offensive tackle Gary Zimmerman and quarterbacks Jim Kelly of the University of Miami and Steve Young of Brigham Young University, began their professional careers with the USFL's Memphis Showboats, Los Angeles Express, Houston Gamblers, and Los Angeles Express, respectively. A number of NFL veterans of all talent levels played in the USFL. It is true that some NFL backups such as quarterbacks Chuck Fusina and Cliff Stoudt, G Buddy Aydelette, and WR Jim Smith who had limited success in the NFL became major stars in the USFL. However, many NFL backups struggled or did not make it in the USFL. Additionally, the USFL also lured in NFL starters, including a handful of stars in the primes of their careers, including the 1980 NFL MVP, Cleveland Browns' quarterback Brian Sipe, the Buffalo Bills' three-time pro bowl running back Joe Cribbs, and the Kansas City Chiefs' three-time pro bowl safety Gary Barbaro. The USFL was the brainchild of David Dixon, a New Orleans antiques dealer, who had been instrumental in bringing the New Orleans Saints (and building their current home stadium, the Superdome) to town. In 1965, he envisioned football as a possible spring and summer sport. Over the next 15 years, he studied the last two challengers to the NFL's dominance of pro football—the American Football League and the World Football League. In 1980, he commissioned a study by Frank Magid Associates that found promising results for a spring and summer football league. He had also formed a blueprint for the prospective league's operations, which included early television exposure, heavy promotion in home markets, and owners with the resources and patience to absorb years of losses—which he felt would be inevitable until the league found its feet. He also assembled a list of prospective franchises located in markets attractive to a potential television partner. Knowing that a number of past challengers to the NFL had foundered due to financial troubles, Dixon wanted to ensure that USFL teams had the wherewithal to put a credible product on the field. To that end, the league required potential owners to submit to a detailed due diligence and meet strict capitalization requirements. Notably, owners had to post a $1.5 million letter of credit for emergencies. With respected college and NFL coach John Ralston as the first employee, Dixon signed up 12 cities—nine where there already were NFL teams and three where there were not. The Dixon Plan called for teams in top TV markets to entice the networks into offering the league a TV deal. All but two of the 12 initial teams were located in the top 13 media markets in the US. After almost two years of preparation, Dixon formally announced the USFL's formation at the 21 Club in New York City on May 11, 1982, to begin play in 1983. ESPN president Chet Simmons was named the league's first commissioner in June 1982. According to the Dixon Plan, if the league was going to be a success, it needed television revenue and exposure. In 1983, the league signed contracts with both over-the-air broadcaster ABC and a cable TV broadcaster, the then-fledgling ESPN, to televise games. The deals yielded roughly $13 million in 1983 and $16 million in 1984, including $9 million per year from ABC. ABC had options for the 1985 season at $14 million and 1986 at $18 million. Each week, there would be a nationally televised game, as well as the USFL's own version of Monday Night football. Like almost all startup pro football leagues, the USFL had some off-the-field factors that prevented the league from starting out with their preferred membership. The problems started when the original owner of the Los Angeles franchise, Alex Spanos, pulled out and instead became a minority owner (and eventually majority owner) of the NFL's San Diego Chargers. Jim Joseph, a real estate developer who had lost out to friend Tad Taube for the USFL's San Francisco Bay Area franchise, had thought he would be content to be a part-owner of the Oakland Invaders. When the potentially more lucrative Los Angeles franchise became available, Joseph snapped up the rights to the area. The owners of the USFL's San Diego franchise, cable television moguls Bill Daniels and Alan Harmon, were denied a lease for Jack Murphy Stadium—in part due to pressure from the Chargers (Major League Baseball's Padres held the lease to the stadium at the time). Los Angeles was seen as critical to the league's success, and Dixon and Simmons felt that two cable moguls would be better suited to head the league's efforts there. Joseph was forced to move his operation. The team opened play in Phoenix, Arizona, where it became the Arizona Wranglers. Daniels and Harmon's team became the Los Angeles Express. The League's Boston franchise, the Breakers, also had stadium problems. The Boston ownership group wanted to play in Harvard Stadium, but were unable to close a deal with the university; Sullivan Stadium was owned by the New England Patriots, who were unwilling to share their venue with a rival, while Fenway Park was being used in the spring by the Boston Red Sox and was unavailable, and Alumni Stadium on the campus of Boston College, for reasons never made public, also declined. Finally they were able to negotiate a lease to play at Nickerson Field on the campus of Boston University, a facility that seated only 21,000 people. There were plans to establish four franchises in Canada prior to the inaugural season, located in Vancouver, Edmonton, Montreal and Southern Ontario (specifically at Ivor Wynne Stadium in Hamilton, Ontario). The proposal was pushed by John F. Bassett, the Canadian who would go on to own the Tampa Bay Bandits USFL team. However, Senator Keith Davey warned that the Canadian government would act to protect the Canadian Football League from competition. The Canadian Football Act had been proposed, but not approved, when Basset had tried to establish the Toronto Northmen in the World Football League in 1974. Such legislation would have banned US football leagues from playing in Canada. In particular, Montreal's CFL team, the Concordes, was on precarious financial ground, having just been established to replace the recently folded Alouettes. This led Bassett to drop the idea. Once play actually started, the league experienced the same kind of franchise instability, relocation, and closures that almost all pro football leagues, including the NFL, experienced in their early years. The Washington Federals finished tied with the Arizona Wranglers as the league's worst team with 4–14 records. The Federals were coached by the Canadian Football League's fourth most successful coach at the time, Ray Jauch. The team was injury prone and mistake prone, on and off the field. Prior to the 1983 season, the team traded away the rights to the league's leading sacker, linebacker John Corker to Michigan for a 5th round pick. In spite of a rotating door at QB, the Federals lost 8 games by a TD or less, a fact that gave team owner Berl Bernhard hope for the 1984 season. The 1983 team finished second to last in attendance drawing 13,850 per game. New Jersey Generals' running back Herschel Walker emerged as the league's first superstar running for 1,812 yards and 17 TDs. However, the team only won 6 games. The Denver Gold won only 7 of 18 games in their first year, but finished first in the league in attendance drawing an average of 41,736 fans to see a team that featured a number of former Broncos. Team owner Ron Blanding stuck to his budget, and took great pride in seeing his team defeat the big budget Chicago Blitz in Chicago 16–13 in week three on a TD run with 22 seconds to go. Blanding fired very popular former Broncos Coach Red Miller after a 4–7 start, but was still able to finish the season with strong attendance. Due to low attendance numbers and over budget spending on players on all the other teams in the league, Blanding's Gold was the only USFL team to turn a profit in 1983. The Oakland Invaders finished 9–9 and won the Pacific Division behind the play of 29-year-old quarterback Fred Besana and former Oakland Raiders tight end Raymond Chester and halfback Arthur Whittington. Besana had played for the Twin City Cougars of the California Football League from 1980 to 1982, but played like a proven veteran, finishing the season as the league's second rated passer. In spite of a strong team led by 36-year-old former WFL quarterback Johnnie Walton and CFL veteran halfback Richard Crump, the Boston Breakers were unable to draw the regular sellouts they needed to survive at Nickerson. (Even when they sold out Nickerson, they still lost money due to its small capacity.) Boston finished the season 11–7, narrowly missing the playoffs. Walton, who had retired from pro football years earlier, and had spent the previous 3 years coaching college football, was the league's 7th ranked passer. Boston and Washington were the only USFL teams to draw less than 14,000 per game in 1983. The other 10 teams drew over 18,000 per game. The George Allen-led, Chicago Blitz had been described as an "NFL caliber" team and were heavily favored to win the title and dominate the rest of the league. The team was stacked with quality players, led by NFL veteran quarterback Greg Landry, rookie HB Tim Spencer of Ohio State, and rookie wide receiver Trumaine Johnson of Grambling. In week two, Jim Joseph's Arizona Wranglers led by rookie quarterback Alan Risher of LSU came from a fourth quarter 29–12 deficit to defeat the Blitz 30–29 in a game considered by many to be the biggest upset in USFL history. The Blitz would go on to lose five more games in the regular season and be edged out by Michigan for the Central Division title. In the first round of the playoffs, the Blitz would carry a 38–17 lead into the fourth quarter vs. the host Philadelphia Stars before losing to the Stars 44–38 in OT. The Philadelphia Stars finished a league best 15–3. Led by Coach Jim Mora, NFL veteran quarterback Chuck Fusina, rookie halfback Kelvin Bryant of North Carolina and a very good defense led by linebacker Sam Mills, the Stars made it to the title game where they almost came back from a 17–3 third quarter deficit before falling 24–22 to the Michigan Panthers. Michigan Panthers owner A. Alfred Taubman quickly decided he was willing to pay to fill the holes on his team with NFL caliber talent. Early in the season, the Panthers signed NFL vets guard Thom Dornbrook, tackle Ray Pinney, fullback Cleo Miller and defensive end John Banaszak. Consequently, after a 1–4 start, the team jelled and finished the regular season 11–2, edging out Chicago for the Central Division title. They dispatched Oakland in the playoffs 37–21 and weathered a frantic comeback by the Stars to become the first league champions. On the whole, the inaugural season was a success for the league. Attendance was in line with league expectations at about 25,000 fans per game, and television ratings slightly exceeded projections (an average Nielsen rating of 6.1, when the league had aimed for 5.0). The brand of play was exciting and entertaining, and the 1983 championship was generally recognized as being a more entertaining game than most of the Super Bowls of the era. Even in cities where the fans were not numerous, the fan base was passionate; the documentary Small Potatoes: Who Killed the USFL? made note of a regular-season game in which Boston Breakers fans stormed the field following a come-from-behind victory at Nickerson Field. In September 1983, the New Jersey Generals were sold to real-estate magnate Donald Trump. The Boston Breakers were unable to find a more suitable venue within Boston and its surrounding areas, so the Breakers relocated to New Orleans on October 18, 1983 and later sold to New Orleans businessman Joseph Canizaro. Needing fresh capital, the league chose to expand league membership from 12 to 18 teams, adding the Pittsburgh Maulers, Houston Gamblers, San Antonio Gunslingers, Memphis Showboats, Oklahoma Outlaws and Jacksonville Bulls. The Dixon plan called for expansion to 16 in the league's second year. The Outlaws were originally slated to play in San Diego, but as was the case with what became the Express, could not get a lease for Jack Murphy Stadium. The Outlaws opened play in Tulsa at Skelly Stadium. The Gamblers were technically not an expansion team. Founder David Dixon had reserved a franchise for himself in founding the league. He had chosen not to field a team in 1983 to help guide the league. By 1984, Dixon was disgusted with the path the league was on and the league owners were sick of Dixon's constant complaints about them overspending. With their blessing, he sold his franchise for slightly less than the $6 million expansion fee. Dixon's franchise became the Houston Gamblers. After seeing the Wranglers lose ten games in a row to finish 4–14 (tied with Washington for the league's worst record) and perhaps more importantly seeing attendance wilt in the summer heat at Sun Devil Stadium, Joseph decided to sell the Wranglers. Meanwhile, in spite of having the league's highest profile coach, George Allen, and being at worst the third best team in the league, the Chicago Blitz had drawn an anemic 18,133 per game, unable to contend with Major League Baseball's Cubs and White Sox, the latter on their way to the postseason for the first time in 24 years. Blitz owner Dr. Ted Diethrich, a Phoenix resident, felt the losses did not justify an investment so far from his home in Phoenix. Diethrich sold the Blitz to Milwaukee heart surgeon James Hoffman, and then bought the Wranglers from Joseph. Almost immediately after Diethrich closed on his purchase of the Wranglers, he and Hoffman swapped their team assets—coaching staff, most of the players, and all. To Blitz fans, it seemed that Hoffman had jettisoned one of the league's elite teams in favor of a team that tied for the league's worst record. In truth it was worse than that. In a league starved for competent QB play, Wrangler triggerman Alan Risher stayed in Arizona. The new Blitz would feature longtime Bear backup QB Vince Evans (signed in November 1983 to a four-year, $5 million deal). In January, The Blitz tendered an offer that would have been the largest contract in football – $2 million a year for three years—to Bears running back Walter Payton. Payton advised he would consider the offer, but would not be rushed by the Blitz. The Blitz's 1984 season was scheduled to start on February 27, 1984, and they had little success selling season tickets. The Blitz needed Payton to sign quickly to help season ticket sales, so they had put a deadline on the offer of February 9, 1984. Before he made up his mind, the Blitz withdrew the offer realizing they simply did not have the finances. With a less talented team and no big names to excite the fans, Chicago's season ticket sales predictably flatlined, in spite of Hoffman sinking a lot of money into advertising. Just prior to the start of the season, a frustrated Hoffman walked away from the Blitz, leaving the team to the minority owners. The Los Angeles Express were sold to J. William Oldenburg and the New Jersey Generals were sold to Donald Trump. The league believed that the teams based in the nation's two largest markets were owned by the owners with the deepest pockets. Trump and Oldenburg both went on signing sprees. Trump poached several NFL starters, including Cleveland's QB Brian Sipe. Oldenburg's Express went after a number of highly regarded collegiate players. This combined with a general lack of quality QBs (only nine QBs in the 12-team league finished the 1983 season with QB ratings above 70) and HBs (even in an 18-game season only six rushers broke the 1000 yard mark) tipped off another explosion in league spending as USFL teams raided the NFL and college ranks to keep up. The USFL went to a seven-man officiating crew in 1984 adding the side judge. After a game 1 blowout 53–14 road loss to the expansion Jacksonville Bulls, Washington Federals head coach Ray Jauch was fired. In week 2, star RB Craig James was injured. The team collapsed. Despite solid play from 2nd year QB Mike Hohensee, WR Joey Walters, and HB Curtis Bledsoe, the team would finish 3–15, losing twice to the 3–15 expansion Pittsburgh Maulers and going 0–7 vs. the expansion teams. With seven games to go in the season, a press conference was held to announce the Federals had been sold to Sherwood "Woody" Weiser who intended to move the team to Miami. The team would be coached by Miami Hurricanes' coach Howard Schnellenberger. After two games, William Tatham Jr., son of Oklahoma Outlaws owner William Tatham, announced Skelly Stadium was insufficient to support a pro team and that the Outlaws would be moving the following year. In spite of this lame duck status, awful spring weather, and a season-ending ten-game losing streak, the team drew an average of 21,038 fans per game. The expansion Houston Gamblers rookie QB Jim Kelly of the University of Miami emerged as the league's second superstar carrying his team to win the central conference with a 13–5 record. Kelly threw 44 TDs and piled up over 5,000 yards. The Gamblers would fall to the eventual league runner up Arizona Wranglers in the playoffs, 17–16. The Los Angeles Express' signings of high-profile collegiate players culminated with the signing of BYU QB Steve Young to a $40 million guaranteed contract—at the time, far and away the largest contract in pro football history. The young talent was slow to adapt to the pro game and the Express continued to hover around .500. With one of the leagues' highest payrolls and poor attendance, financial losses mounted. It is estimated that the Express lost as much as $15 million in 1984. The Express did manage to make the playoffs and defeated the defending league champion Panthers 27–21 in triple overtime, before falling to the eventual league runners-up, Allen's Arizona Wranglers, 35–23. In spite of seeing his Wranglers team make it to the title game,  Ted Diethrich had seen enough. He had lost millions for the second year in a row. Despite fielding a dramatically improved team, he had only had seen a negligible increase in attendance in Arizona over the previous year's numbers. The Philadelphia Stars again finished with the league's best record and made it to the title game, this time defeating Dietrich's Wranglers, 23–3. Seeking a larger market, a larger stadium, and to share expenses, the Outlaws sought to merge with the Oakland Invaders, but Oakland Invaders owner Tad Taube walked away from the deal rather than give control of the team to Outlaws part-owner and general manager William Tatham Jr.
After the league officially announced plans to move to the fall in 1986 (see below), a number of teams moved elsewhere after their owners decided they could not directly compete with the NFL. The Breakers moved a second time, this time to Portland, Oregon. The defending champion Philadelphia Stars moved to Baltimore, capitalizing on the departure of the NFL's Colts to Indiana. The Michigan Panthers merged with the Oakland Invaders, while the Pittsburgh Maulers folded after losing a reported $10 million in their only season. Around the same time, Weiser pulled the plug on his deal to buy the Federals and move them to Miami. Bandits minority owner Donald Disney stepped in 5 days later and bought the Federals. Under his ownership, the team was moved to Orlando, where they became the Orlando Renegades. Einhorn, one of the principal advocates of fall play, decided to sit out the 1985 season. ABC cleared this move due to the league's anemic ratings in Chicago, allowing the league to shut down the Blitz, who had lost nearly $6 million in 1984. The league financed and ran the Express all season, but could not find an owner. With a huge salary burden and dreadful attendance, the Express barely survived the season. San Antonio Gunslingers owner Clinton Manges stopped paying the team's bills with about a month to go in the season. The Denver Gold's attendance flatlined due to the planned move to the fall, as fans were not willing to choose between the Gold and the NFL's Broncos. The Gold would have hosted a playoff game against the Memphis Showboats, but ABC forced the league to move the game to Memphis rather than endure the embarrassment of playing in a near-empty Mile High Stadium. Los Angeles and Oakland announced that they would suspend operations. Although Eddie Einhorn remained involved with the league's antitrust lawsuit, he opted not to field a Chicago team in the USFL's fall 1986 season as planned, and the team was left off the proposed 1986 schedule. Tampa Bay initially pulled out of the league, prepared to continue playing in the spring even if it meant forming a new league; owner John Bassett was, in either case, too ill to continue and would die on May 14, 1986. Lee Scarfone agreed to take over the Bandits' USFL franchise in July 1985 and have the team play a fall schedule. Some franchises folded before or after a season's play, and others moved and/or merged. However, unlike the WFL and other leagues that have competed against the NFL, no USFL team actually folded during a season's play. This was because, with the notable exception of San Antonio, all of the league's teams were fairly well capitalized from the start, as Dixon had anticipated the league would have to absorb years of red ink before coming into its own. By comparison, most of the WFL's teams appeared to be severely undercapitalized. Chicago, Los Angeles, and San Antonio did come close to folding in midseason, but league intervention helped these teams make it through. Arizona, Baltimore, Birmingham, Jacksonville, Memphis, New Jersey, Orlando and a newly reorganized Tampa Bay were scheduled to play an 18-game fall schedule season in 1986. At the time, only New Jersey and Tampa Bay shared markets with an NFL team (in New Jersey's case, they shared two NFL teams). Teams plan for large year 1 pre-season promotional budgets to introduce the team to the local market. A tight players' salary cap of US$1.8 million per team. The NFL introduced a salary cap in 1994. The Dixon plan laid out a budget to allow all teams to manage losses in the initial lean years. As mentioned earlier, teams had to post a $1.3 million line of credit for emergencies. The league's TV revenue met the requirements of the Dixon plan. The Plan called for first year attendance over 18,000 per game. In 1983, 10 of the 12 teams exceeded that threshold. Player spending was where the league deviated from the plan, in the name of pursuing stars. The league's biggest splash—the signing of Herschel Walker, a three time All-American and the 1982 Heisman Trophy winner—represented a significant breach from the Dixon Plan. Like the NFL, the USFL barred underclassmen from signing. However, league officials were certain that this rule would never stand up in court, so they allowed Walker to sign with the New Jersey Generals. More importantly, Walker signed a three-year contract valued at $4.2 million with a $1 million signing bonus. Due to the USFL's salary cap rules, this was a personal-services contract with Generals owner J. Walter Duncan, and not a standard player contract. Nonetheless, the other owners did not raise any objections, knowing that having the reigning Heisman winner in the fold would lend the league instant credibility. Other marquee stars to sign with the league were Craig James, Anthony Carter and Kelvin Bryant as well as some familiar NFL vets like Chuck Fusina and members of the NFL vet laden Chicago Blitz, like Greg Landry, showed that the upstart league was a credible challenger to the NFL. The league also made a serious run at some other stars, such as Eric Dickerson and Dan Marino. The pursuit of top-level talent proved to be a double-edged sword. While the presence of many blue-chip stars proved the league could put a competitive product on the field, many teams wildly exceeded the league's player salary cap in order to put more competitive teams on the field. For instance, the Michigan Panthers reportedly lost $6 million—three times what Dixon suggested a team could afford to lose in the first season—even as they became the league's first champions. The desire to compete with other loaded USFL teams and for the league to be seen as approaching NFL caliber led to almost all of the teams exceeding the Dixon Plan's team salary cap amount within the league's first 6–18 months. Dixon urged the members of the league to reduce spending. Rather than backing off spending, recommitting to a firmer salary cap, and dispersing some of the larger contracts to expansion teams to alleviate the problem, the league sought other options to take on revenue to cover increased costs overruns. These actions magnified the problem. The league added six more teams in 1984 rather than the four initially envisioned by Dixon, to pocket two more expansion fees. This put more pressure on the TV deal, which was not designed to support an 18 team league. A frustrated Dixon sold his stake and got out. With the new wave of teams, more college stars like Marcus Dupree, Mike Rozier, Reggie White, Jim Kelly, Steve Young and other young stars of the day signed high dollar contracts to play for USFL teams in 1984, as did high-profile NFL stars like Doug Williams, Brian Sipe, Joe Cribbs, and Gary Barbaro. In 1984, the league began discussing the possibility of competing head-to-head with the NFL by playing its games in the fall beginning in 1986. The strongest proponents of playing in the fall were Chicago owner Eddie Einhorn and Generals owner Donald Trump. Einhorn and Trump argued that if the USFL moved to the fall, it would eventually force a merger with the NFL in which the older league would have to admit at least some USFL teams. They also argued that if a merger did occur, the surviving teams' original investment would more than double. A consulting firm recommended sticking with a spring season. Despite the protests of many of the league's "old guard", who wanted to stay with the original plan of playing football in the spring months, on August 22, 1984 the owners voted to move to the fall starting in 1986 . On April 29, 1985, the league's owners voted 13-2 to reaffirm their decision to begin playing a fall season in 1986. Tampa Bay Bandits owner John F. Bassett, who had registered one of the two "nay" votes, declared his intention to pull his team out of the USFL and organize a new spring football league. However, failing health (he died from cancer in May 1986) forced Bassett to abandon his plans and sell the Bandits to minor partner Lee Scarfone, who agreed to keep the franchise in the USFL. The spring advocates had lost, and the fall advocates now set their sights on forcing a merger with the NFL, or at the very least winning a sizable settlement and securing a TV network for fall broadcasts. The USFL had jettisoned its original model of spring football in favor of the risky gamble (but potentially lucrative return) of going head-to-head with the NFL. As a direct result of this decision, the Pittsburgh Maulers folded rather than compete with the Pittsburgh Steelers, the sale of the struggling Washington Federals to Weiser's Miami-based ownership group collapsed, the New Orleans Breakers and 1984 champion Philadelphia Stars had to relocate, and the 1983 champion Michigan Panthers surprised the commissioner with an announcement that they would not be playing in the Detroit area for the 1985 season. Panthers owner A. Alfred Taubman informed the league at the meeting that he had negotiated a conditional merger with Tad Taube's Oakland Invaders depending on the outcome of the vote, with Taubman as majority owner. With an expectation of fall play in 1986, Einhorn decided not to field a team for the final lame duck spring 1985 season. Within a few weeks of the decision, the USFL had been forced to abandon four lucrative markets, abort a move to a fifth and suspend operations in a sixth. In hindsight, this destroyed the USFL's viability, although the Maulers folding likely would've happened anyway due to the team being owned by shopping mall magnate Edward J. DeBartolo Sr. (who also owned the National Hockey League's Pittsburgh Penguins at the time), whose son Edward J. DeBartolo Jr. owned the Super Bowl champion San Francisco 49ers (a team now owned by his sister Denise DeBartolo York), causing a potential conflict of interest for the family between the USFL and the NFL. ABC offered the USFL a 4-year, $175 million TV deal to play in the spring in 1986. ESPN offered $70M over 3 years. Following all the mergers and shutdowns, there just were not enough spring football advocates left in the league to accept those contracts. The owners in the league walked away from what averaged out to $67 million per year starting in 1986 to pursue victory over the NFL. After the 1985 season, more plans were announced to accommodate the fall schedule, pool financial resources and avoid costly head-to-head competition with NFL teams. Two mergers were announced. The Denver Gold merged with the Jacksonville Bulls, with the Bulls as the surviving team. Trump bought the assets of the Houston Gamblers for an undisclosed amount and merged them with the New Jersey Generals. While the Generals were the surviving team, Gamblers coach Jack Pardee was named as the merged team's new coach. Both the Gold and Gamblers had seen their attendance plummet to unsustainable levels, as their fanbases were not willing to abandon the Denver Broncos and Houston Oilers, respectively. In spite of all of these changes, the USFL would never play a fall game. In another effort to keep themselves afloat while at the same time attacking the more established National Football League, the USFL filed an antitrust lawsuit against the older league, claiming it had established a monopoly with respect to television broadcasting rights, and in some cases, on access to stadium venues. The case was first heard by Judge Peter K. Leisure. The USFL claimed that the NFL had bullied ABC, CBS and NBC into not televising USFL games in the fall. It also claimed that the NFL had a specific plan to eliminate the USFL, the "Porter Presentation." In particular, the USFL claimed the NFL conspired to ruin the Invaders and Generals. The USFL sought damages of $567 million, which would have been tripled to $1.7 billion under antitrust law. It hoped to void the NFL's contracts with the three major networks. The USFL proposed two remedies: either force the NFL to negotiate new television contracts with only two networks, or force the NFL to split into two competing 14-team leagues, each limited to a contract with one major network. The lawyer for the USFL, Harvey Myerson, had what he felt were three "smoking guns". A memo from March 1973 to NFL broadcasting director Robert Cochran, from attorney Jay Moyer stating that an "open network" might be open to the "invitation to formation of a new league." A memo from August 1983 from NFL management council executive director Jack Donlan to his staff. The memo laid out plans for NFL teams to "increase salary offers to USFL to existing players or run the risk of losing them." A 1984 presentation to NFL executives by Harvard Business School professor Michael Porter, which included a plan on "how to conquer" the United States Football League. All but one of the league's 28 teams was named as a co-defendant. Al Davis, owner of the then-Los Angeles Raiders, was a major witness for the USFL and had been excluded from the lawsuit in exchange for his testimony. ABC Sports' Howard Cosell was also a key witness for the USFL. The case went to trial in the spring of 1986 and lasted 42 days. On July 29, a six-person jury handed down a verdict that devastated the USFL, even though it technically won its case. The jury declared the NFL a "duly adjudicated illegal monopoly", and found that the NFL had willfully acquired and maintained monopoly status in professional football through predatory tactics. However, it rejected the USFL's other claims. The jury found that the USFL had changed its strategy to a more risky goal of forcing a merger with the NFL. Furthermore, the switch to a fall schedule caused the loss of several major markets (Philadelphia, Denver, Houston, Pittsburgh, Detroit, Miami, the Bay Area). The jury also made note of a memo Tad Taube wrote about the dispute, which quoted the comic strip Pogo: "we have met the enemy and he is us." Most importantly, the jury found that the NFL did not attempt to force the USFL off television. (Indeed, ESPN remained willing to carry USFL games in the fall, several of the league's teams also had local broadcast contracts, and 1986 also happened to be the inaugural season of the Fox Broadcasting Company, a network that would eventually become the fourth major broadcast network.) In essence, the jury felt that while the USFL was harmed by the NFL's de facto monopolization of pro football in the United States, most of its problems were due to its own mismanagement. It awarded the USFL nominal damages of one dollar, which was tripled under antitrust law to three dollars. It later emerged that the jury incorrectly assumed that the judge could increase the award. The verdict was a classic Pyrrhic victory. The USFL had essentially staked its future on the outcome of the suit, banking on a substantial settlement to finance the move to the fall. It considered the television-related claims to be the heart of its case. 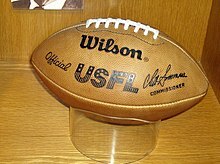 On August 4—four days after the announcement of the verdict—the USFL owners voted to suspend operations for the 1986 season, with the intent of returning in 1987; the league accurately foresaw the 1987 players' strike and had hoped the strike would give the league access to star players. Players signed to contracts were free to sign with NFL (or other professional teams) immediately. Indeed, the NFL had held a draft in 1984 for teams to acquire the rights to USFL players, in the event of the league (or teams in the league) folding; even NFL commissioner Pete Rozelle, upon hearing the initial guilty verdict, walked out of the courtroom knowing that the USFL had effectively shut down by trying to take on the NFL. However, it is unlikely the USFL would have been able to put together a viable product in any case. Many of its players had signed contracts with NFL teams after the 1985 season, and the league was some $160 million in debt. The USFL appealed the award, but it was rejected by the United States Court of Appeals for the Second Circuit in 1988. This decision ended any chance of the USFL returning to the field, and the league's seven remaining teams voted to formally disband shortly afterward. However, because the USFL was at least nominally the winner of the lawsuit, the NFL was required to cover the USFL's attorney fees and costs of litigation, and the USFL was awarded over $5.5 million in attorney fees and over $62,000 in court costs. That award was appealed by the NFL; it was affirmed on appeal and ultimately allowed to stand by the U.S. Supreme Court in 1990, four years after the USFL had ceased operations. The USFL had a significant impact on the NFL both on the field and off. Almost all of the USFL's on-field innovations were eventually adopted by the older league, and a multitude of star players in the USFL would go on to enjoy very successful careers in the NFL. The NFL would also eventually have franchises in some of the markets which the USFL had proved fertile for pro football or had renewed interest in the game. Jacksonville, in particular, was being courted by the Houston Oilers as a potential relocation destination as early as 1987; that city eventually got the expansion Jaguars in 1995. The Oilers would instead relocate to Tennessee in 1997, initially playing one season in Memphis (to minuscule crowds) before moving to Nashville to become the Tennessee Titans. Although the USFL's stay in Baltimore was brief, the city's acceptance of the Stars, coupled with the success of the Canadian Football League's Baltimore Stallions a decade later, were factors in Art Modell's decision to relocate his NFL franchise to Baltimore to become the Baltimore Ravens in 1996. Arizona was never one of the USFL's strongest markets but still managed to lure the former St. Louis Football Cardinals to take up residence in the state in 1988. Three decades after the USFL's failure, the NFL awarded the 2017 Pro Bowl to Orlando. Outside the NFL, Tampa Bay's embrace of Bandit Ball and the rapid growth of the Sun Belt prompted the establishment of other major league teams in the metro area: the National Hockey League's Tampa Bay Lightning and Major League Baseball's Tampa Bay Rays. Other cities that did not get NFL franchises, such as Birmingham, Memphis and Orlando, would receive teams from the numerous short-lived pro football leagues that have attempted to launch in the years that have followed, such as the 2001 XFL (which, with the lone exception of the Las Vegas Outlaws, resided entirely in USFL markets), CFL, UFL, AAF and 2020 XFL. The collapse of the USFL had a particularly positive effect on the NFL's Buffalo Bills. The Bills, as a small-market NFL franchise, were particularly hard-hit by the USFL; as its players from the moderately successful early 1980s era aged, the team was unable to find quality replacements for them on the free agent market, as the USFL was drawing away much of pro football's top talent (including Bills running back Joe Cribbs and the team's planned franchise quarterback of the future, Jim Kelly). With subpar talent, the Bills went 4–28 over the course of 1984 and 1985, and average attendance at Rich Stadium plummeted to under 30,000 fans per game, putting the team's long-term viability in jeopardy. When the USFL collapsed, the Bills signed a large number of former USFL players: Kelly, Kent Hull, Ray Bentley, special teams coach Bruce DeHaven, general manager Bill Polian and coach Marv Levy, which, combined with the high draft picks compiled during the USFL years, would allow the Bills to rise to perennial Super Bowl contenders by the early 1990s. In 2014, after founding owner Ralph Wilson died, Trump tried to purchase the Bills, but was largely rebuffed in favor of Terry Pegula due in part to his past ties to the USFL (as well as Trump's low bid compared to Pegula's); Trump's failure to purchase the Bills was cited as a major factor in his ultimately successful decision to run for President of the United States the next year. It was no coincidence that most of the USFL's most successful markets were in the Sun Belt. Tampa Bay, Jacksonville, Birmingham and Memphis were consistently among the league's leaders in attendance, mainly because none of those cities had to compete against Major League Baseball teams for the spring sports dollar. Of those cities, only Tampa Bay now has a baseball team; the Rays, formerly known as the Devil Rays, didn't arrive until 1998. Along with Philadelphia/Baltimore (the league's most successful team, and one that was about to step into a recently abandoned NFL market) and New Jersey (with Trump's deep pockets, the league's greatest player in Walker, strong attendance, and distance from New York's MLB teams), this collection of teams were widely reckoned as at least having the potential to be viable ventures had the USFL stuck to its original springtime concept and been more financially sound. The league also had an indirect impact on the scheduling of televised football games. The USFL had planned to go against the NFL in the fall of 1986 without directly playing its games opposite the larger league by playing its games on Sunday nights, when the NFL did not play yet. One year later, ESPN and the NFL launched Sunday Night Football in the time slot. The last player of the USFL on an NFL roster was Philadelphia Stars punter Sean Landeta, who was signed in late 1986 by the New York Giants. He officially announced his retirement on March 6, 2008, the 25th anniversary of the first USFL game. (He last played in 2006 but he did not officially retire during the 2007 season.) The last non-kicker to retire was quarterback Doug Flutie, who played in both the CFL and NFL until 2005. The USFL, compared to other professional leagues of the late 20th and 21st centuries, did not radically change the rules of the game; its rules largely resembled a hybrid of the NFL and college football rulebooks. The league's rule on stopping the clock was one example of this hybrid approach: outside the two-minute warning, the clock ran between plays after a first down like in the NFL, while after the warning, it stopped between the end of the play that earned a first down and the placement of the ball back into play (to allow the chain crew to get into place), as is done in college football. Like college football, it recognized the two-point conversion that would not be put into NFL rules until 1994. Chet Simmons (June 13, 1982 –January 14, 1985); resigned under pressure from owners. Harry Usher (January 15, 1985 – 1987); league ceased operations. Due to the legal aftermath of the failed lawsuit against the NFL, the USFL folded and this divisional format never came to fruition. Out of the 23 USFL teams, only five played for the league's entire three-season duration without relocating or changing team names: Denver Gold, Los Angeles Express, Birmingham Stallions, New Jersey Generals, and Tampa Bay Bandits. Only the latter three teams would have remained on this list if the league had continued in 1986. The 1985 game was originally to be played at the Pontiac Silverdome, but after the Panthers merged with Oakland, the game was awarded to Giants Stadium. Had there been a 1986 season, the championship game was scheduled to be played at Jacksonville's Gator Bowl Stadium on February 1, 1987. The USFL held its 1983, 1985 and 1986 college drafts at the Grand Hyatt Hotel in New York. The 1984 draft was held at the Roosevelt Hotel in New York. The 1983–85 drafts were in January while the 1986 draft was held in May. The USFL held an expansion draft in September 1983 for the 6 expansion teams that started play in 1984. In December 1984, they had a dispersal draft for Chicago, Pittsburgh, Oklahoma and Michigan. In addition to the four college drafts, the league also held three USFL Territorial Drafts that allowed teams to select collegiate players from within their geographic area before they entered the general collegiate draft. Of the four first overall draft picks in its history, only 1984 top pick Mike Rozier actually played in the USFL. Dan Marino and Jerry Rice chose to play in the NFL, where they were also picked in the first round by the Miami Dolphins and San Francisco 49ers, respectively, and each went on to have Hall of Fame careers. The USFL ceased operations soon after the 1986 draft, so Mike Haight never signed with nor played in the league. ^ "Dave Dixon, driving force behind Superdome, dies". ^ "The USFL proved part of its case against the NFL only to see the jury sack the winners for a loss". ^ Richard Goldstein, "David F. Dixon, Force Behind Saints and Superdome, Dies at 87", The New York Times, August 9, 2010. ^ John McMullen (March 16, 2009). "No use competing with the NFL". Realfootball365.com. ^ a b "Remember the USFL – History". Archived from the original on 2011-03-19. Retrieved 2011-04-06. ^ York, Marty (1983-02-02). "USFL thwarted by Davey". The Globe and Mail. ^ York, Marty (1983-03-22). "Alternative to Tiger-Cats: Bassett sees Hamilton in USFL". The Globe and Mail. ^ "Dixon disgusted". USFL. Retrieved 1 February 2017. ^ "League owners sick of complaints". USFL. Retrieved 1 February 2017. ^ "Payton denies report". NY Times. Retrieved 2 February 2017. ^ "Blitz withdrew offer". USFL. Retrieved 1 February 2017. ^ "Einhorn heads USFL Team". NY Times. Retrieved 2 February 2017. ^ "Outlaws basic information". USFL. Archived from the original on 6 July 2008. Retrieved 2 February 2017. ^ a b "1984–85 off season". USFL. Retrieved 2 February 2017. ^ "USFL.info - Tampa Bay Bandits". ^ Mizell, Hubert (30 April 1985). "By its own hand, USFL will fall into oblivion". St. Petersburg Times. pp. 1C. Retrieved 1 March 2014. ^ "Bassett will pull Bandits out of USFL". St. Petersburg Times - Google News Archive Search. ^ Janofsky, Michael; Times, Special to the New York (23 March 1983). "N.f.l. Sees Conflict in Bid by Debartolo" – via NYTimes.com. ^ Stock, Craig (May 28, 1986). "USFL session offered only ideas, say consultants". The Philadelphia Inquirer. ^ Hoffer, Richard (July 30, 1986). "USFL Awarded Only $3 in Antitrust Decision : Jury Finds NFL Guilty on One of Nine Counts". Los Angeles Times. ^ "Small Potatoes: Who killed the USFL? - ESPN Films: 30 for 30". www.espn.com. ^ Somers, Kent (August 7, 2006). "Twenty years later, USFL still brings fond memories". USA TODAY. ^ "Did Donald Trump's failed NFL ownership bid pave the way for his presidency?". 9 November 2016. ^ "The Evening Independent - Google News Archive Search". news.google.com.